Kay Aplin is an architectural ceramist with a background in site-specific work for the public realm, graduating in Public Art and Design from Chelsea College of Art in 1995, where she specialised in ceramics and glass. For over twenty years, she has undertaken numerous commissions around the UK and internationally, producing a distinct range of art works that have stood the tests of weather and time. Since 2008 she has been based in Brighton. Previous projects include sculptures, wall reliefs, floorscapes, water features, decorative seating and architectural features for new builds. Kay also undertakes private commissions for interiors and gardens including bespoke tiled kitchens and bathrooms, fireplaces, wall features, garden sculpture, tiled flooring and seating. 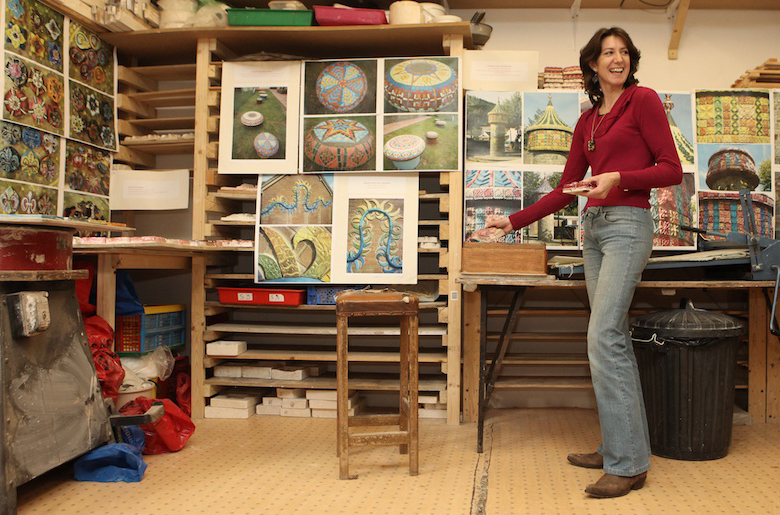 In 2011, Kay initiated the award-winning project The Ceramic House, a pop-up gallery space, her home and living showcase of her work. Through this avenue, she has built a reputation as a curator of contemporary ceramics, with increasingly ambitious projects that match the unstoppable spread of tiles throughout the house. In recent years, Kay has been developing large-scale wall-based ceramic installations for exhibition and by commission. Undertaking residencies in centres such as Guldagergaard International Ceramic Research Centre, Denmark have allowed her the opportunity to experiment, resulting in the creation of new bodies of work. Exhibitions include European Ceramic Context 2014 (Denmark), Shetland Museum and Archives, Sladmore Contemporary, Elit-Tile Triennial (Dominican Republic), Seoul Art Space Mullae (Korea) and British Ceramics Biennial 2017. Kay’s work responds to place, the legacy of a background in public art. Concepts evolve from the surrounding environment and recurring themes are found through observing detail and pattern within nature, particularly flora, and architecture. I am inspired by the spectacular. I strive to achieve a sense of exuberance through colour, texture and ambitious scale. The overall impact of the finished piece is paramount, as is accomplished craftsmanship and exquisite detail. I endow the tactile properties with equal importance to the visual, hence my penchant for relief. I encourage the viewer to touch, as well as look, giving an interactive quality to a visually stimulating piece. Kay’s recent explorations into slip casting porcelain and soda glazed wood firing have had a profound impact upon her practice. Moving into porcelain has been a revelation, both in the refined surface quality of the material and its capacity for colour through the glaze process. Kay’s studio is at Phoenix Brighton. Visits to The Ceramic House or studio are available by appointment to discuss ideas or inspiration for artistic applications for your domestic or commercial space.